ML1 automatically triggers to a sweep sequence with any step width and records the frequency response. 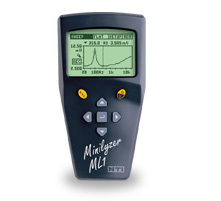 The Minirator MR2 or MR-PRO may be used as signal source. After capture all sweep data is available. Finding wrongly connected speakers is as simple as moving ML1 into the sound field of the speaker under test and its polarity will be displayed. The same measurement through the XLR input is ideal for cable tests. Intermittent faults are often hard to find. The time sweep records the RMS level, frequency and the THD+N value simultaneously, helping to monitor the audio signal during a long period of time for later analysis. Provides a quick and robust look at the waveform of the balanced audio signal, quickly finding clipping amplifiers etc. The auto-scale and auto-trigger functionality are normally only found in expensive stand-alone scopes. Analyze and improve sound systems using the 1/3rd Octave analyzer. With Pink Noise as a stimulus the frequency response of every sound system is directly visible on the Minilyzer screen. The peak frequency display supports you in finding feedback frequencies. Do you have to supply your mix to a broadcast van? By using the vu&PPM meter with free adjustable reference levels you can provide a perfect leveled signal. The vu meter enables you to adjust your outboard equipment for a perfect compression of your sound material.